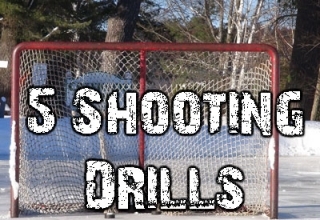 Shooting is a very important skill to practice on the ice and at home. The only problem is that a lot of players do not have the appropriate area to practice shooting at home. 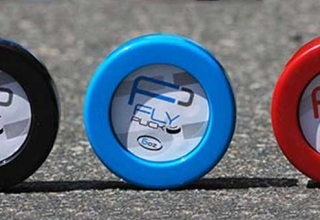 Parents are sometimes worried about the damage that the pucks may cause as this can cost a lot of money. 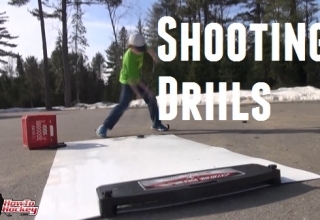 One solution is to provide an area for a child to practice shooting, and a great product is a hockey shooting tarp called the Snipers Edge. 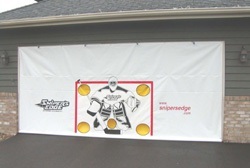 Purpose – The Snipers Edge is a very big tarp that can be hung in a garage or basement to catch and stop pucks. 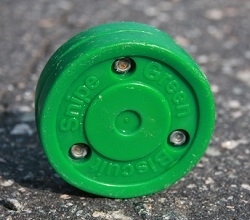 It was designed to reduce the damage caused by stray pucks and give children and adults a target to shoot at. 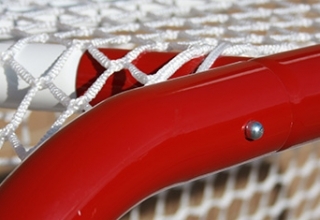 Set-up – The Snipers Edge comes with eyelets at the top and a pocket all along the bottom to insert a rod or doweling in to help it hang properly. The eyelets appear to be fastened securely on an area of the tarp that has been doubled up and double stitched. To set up the tarp you just have to use ropes or bungee cords and you can install it in your basement or garage. Quality – The material looks very durable and they have used double stitching throughout the entire tarp. 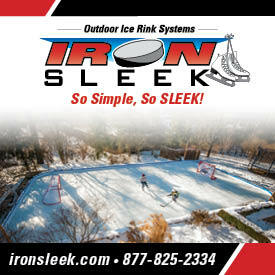 From the looks of the tarp it can hold up to a lot of pucks. 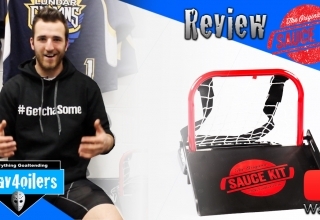 Penalty Box – I couldn’t find any big faults with the product, if you have used this problem and found anything you didn’t like let us know in the comment section. Green Biscuit Snipe – How much can it withstand? I have one and like it. Although I’d rather have a goal, the Snipers Edge prevents my misses and ricochets from putting holes in my drywall. Money well spent. I curious what you used (if anything) for the dowel along the bottom? 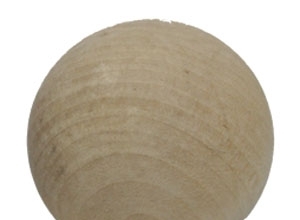 Wood? Metal? Small pieces? One long Piece? 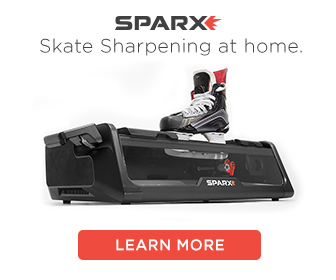 Looks pretty cool especially if you had a shooting pad or to play a little one on one in the drive with a roller puck or puck ball. Yeah just grab some wooden dowling and slide it in there. You could even get some rebar to weigh it down even more. 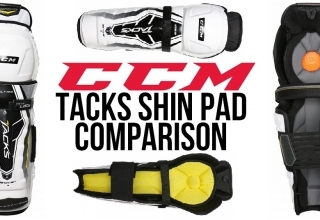 I bought one two months ago for my basement, it is the best investment for a basement hockey training area. We all think we have an accurate shot but there is still that one that gets away on you. With the snipersedge being 8′ by 16′ it save the dry wall and less explaining to your buddys why theres a hole in the dry wall four feet away from the net. 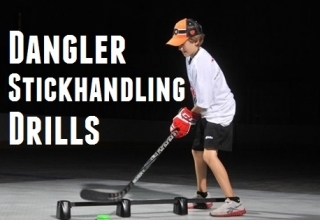 I’v shot everthing at the snipersedge, pucks 6 and 10 oz, stickhandling balls and my kids kick soccer balls at it, and it holds up just fine. We bought this couple of years ago and its great! Put it inside the garage at back wall. 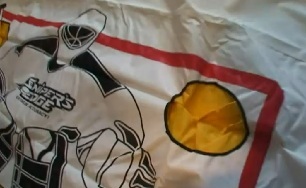 Pucks fly and put dents in the walls but better than putting the dents in your basement! Suggestion: Get the taller one for the extra $10.